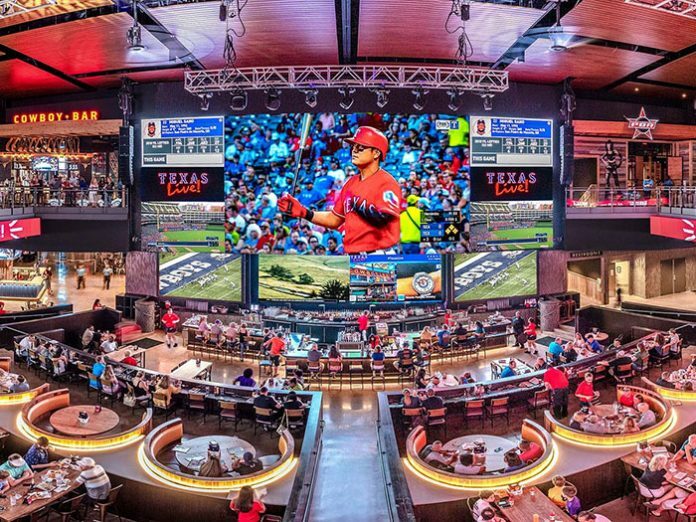 They say everything in Texas is big, and the new 200,000 sq ft Texas Live! entertainment complex certainly fits that bill with its ample array of dining, live music, and other entertainment options—and, next year, the first Live! by Loews boutique hotel. Backed by the Texas Rangers and City of Arlington, among others, the vast $250M complex recently celebrated its grand opening, an event heard loud and clear via Kara and Kiva II systems in two of its primary performance spaces networked via AVB and processed by the Lone Star State’s very first installed P1 digital audio processor. Furthermore, both venues also utilise L-Acoustics’ new AVB-compliant P1 networked digital audio processor, which combines an EQ station with delay and dynamics processing, and a multi-mic acoustic measurement platform with offline delay finder and EQ modelisation. For Arlington Backyard, the Kara speakers put plenty of energy into the room and fulfilled another stipulation by the owners, who wanted a rider-friendly brand in the house to minimise the amount of system movement as different artists passed through. However, the designers also had to be wary of LFE control. The new Live! by Loews boutique hotel would be built along one of the venue’s walls, and noise containment from the venue with respect to the hotel property was a priority. That was managed by arranging the ten SB18m subs in a custom cardioid array. “It really does confine the energy without diminishing the impact in the venue,” he said.